If we rule out internal problems with the frequency converter, what else can cause a frequency converter to run poorly? Remember that a frequency converter is a sensitive electronic device. Unlike equipment that is run across the line, it is not designed to provide maximum power to the load until the motor or the system collapses. The frequency converter will respond to fluctuations in system conditions and eventually drop off on a fault indication, depending on what part of the system is malfunctioning. So how does one go about diagnosing this type of frequency converter problem? 1. Check the system with a good visual inspection. Look for running or dripping water, high humidity, excessive temperature extremes, excessive dirt or contaminant debris, and corrosive agents located near or under the equipment. Here's a good rule of thumb: If you would not place a television near the frequency converter because of the physical environment, then the frequency converter may have problems. If the frequency converter does not have a sealed enclosure to handle rough environmental conditions, care must be taken to protect the frequency converter assembly. 2. Clean the frequency converter of dirt, dust and corrosion. Depending on the environment, there may be significant problems with contaminants. The frequency converter should be relatively clean. Do not allow significant amounts of dirt to build up on the heatsink of the frequency converter. This may prevent sufficient cooling of the frequency converter semiconductors and may damage cooling fans and cause over-temperature problems. 3. Check all wiring connections for tightness. Loose connections in the wiring of the frequency converter to the incoming power and to the motor are a major cause of frequency converter failure. As the frequency converter performs day in and day out, the constant cycle of increasing in temperature and subsequent cooling can cause the connections to loosen over time. Depending on the manufacturer of the unit, the wire used may be highly stranded for flexibility. This type of wire may be difficult to keep tight. Loose connections can contribute to overcurrent trips, destroy IGBTs, cause input rectifiers to fail, and burn terminals on contactors and switches. 4. Check the line voltages and currents coming into the frequency converter. These voltages should be balanced within five percent. Unbalanced line voltage can cause significant problems. Check the current coming into the input of the frequency converter next. Current levels can differ a bit more from phase to phase without causing too much concern, but there is the possibility of finding one line completely dead. Remember, most frequency converters today can still run the motor with one phase of the incoming power missing. 5. Check the frequency converter output for voltage and current. The frequency converter produces the waveform going to the motor. On most frequency converters, the voltage from the inverter section should be balanced within a couple of volts and the current should be balanced, as well. Large variations cause the motor to shake violently and can cause motor problems. These are the basic first steps to determining the problem with any given frequency converter. This process should be done on a periodic basis. If these procedures are followed, most problems can be eliminated and the frequency converter should deliver trouble-free service for many years. Modern frequency converters are amazingly reliable. With advances in semiconductor technology and increased buss capacitor performance, many of the problems that previously plagued frequency converter manufacturers are all but gone. All of the major frequency converter manufacturers build a relatively sturdy and reliable frequency converter. Minimum internal failures ever occur. Problems outside of the frequency converter now contribute to a large number of frequency converter failures and are a major cause of nuisance tripping. Problems with the input to the frequency converter can cause a number of failures. A frequency converter can experience overvoltage or undervoltage trips due to line surges or sags. Or, a frequency converter may experience overcurrent trips or possibly a motor-related fault such as an overload. When dealing with these kinds of faults, a timeline can be very helpful. Document the time of day that the trips occur and then try to determine a pattern. Perhaps the unit trips every day about 10:00 AM. Perhaps the unit trips on undervoltage when the weather gets above 100-deg F. If a pattern of these trips can be established, then a plan of attack can be developed. Remember that the frequency converter is reacting to outside problems by tripping off. Many other problems can cause the frequency converter input to react. If you suspect a problem with the input power, it may be advantageous to have a power quality testing company install monitoring equipment and diagnose the line problems. Poor power quality will often cause needless frequency converter fault trips. Moving to the back of the frequency converter, we can examine some motor-related issues that are a source of many unresolved fault trips. If problems are suspected with the motor or the attaching wire, it is best to apply a Megger to the motor system. Much confusion about this exists in the field. Try to start the process with the wires coming from the frequency converter. My suggestion is to use a 1000-V Megger (meg-ohm meter) if one is available, but a 500-V Megger will do. Do not use the Megger on the output of the frequency converter! A Megger will destroy the IGBTs if used on them, particularly an electronic Megger. The voltage spikes will exceed the peak inverse voltage of the IGBTs and cause them to deteriorate. This will eventually cause a defective transistor. The reason for starting with the wiring from the frequency converter is to divide and conquer the system. All too often, the motor is disconnected at the junction box, only to find that the motor is fine and that the problem actually started with the wiring to the motor. Start with the wire and the motor. 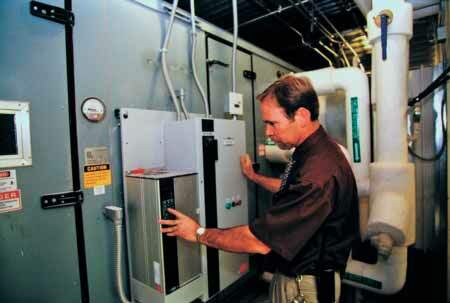 If a ground fault is detected, a simple process of elimination will find the problem. An example would be a situation in which a T1 lead is found to go to ground. Starting with the wire, the next step is to go to the motor disconnect switch (if installed) and disconnect the motor. If the problem goes away, then the problem is with the wire. If the problem persists, then go to the motor. Remove the bindings at the motor and Megger it. If the problem goes away, the problem is with the wires. If the problem is the motor, you must remove the bindings anyway to replace the motor. When performing this test, remember that most wire is not rated to be submerged in water. A flooded conduit will break down and begin to leak the current to ground. This condition often starts as an overcurrent problem before the frequency converter begins to ground fault trip. So a situation can arise in which you've already experienced a ground fault trip, but can't find any ground faulting in the system. This may be due to dampness in the motor system, which can be addressed by reprogramming the frequency converter to dehumidify the motor by passing a DC current through the system while the motor is resting. Most major manufacturers of quality frequency converters have a program provision to allow you to "dry out" a motor with the program point. Check the owner's manual for this information. As you can see, many areas outside of the frequency converter can cause the frequency converter to react adversely. Careful examination of these areas will eliminate much distress and provide a long and trouble-free life for your system.